Even with reliable brands and installation, some conditions are simply out of our control. For instance, half of the U.S. is currently experiencing a drought and has been for some time. During drought conditions, water levels in a well may drop below pump intake, causing an underload situation. 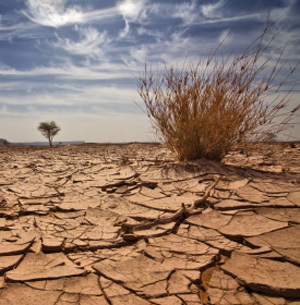 With the lack of snow during the past winter and little rain during the spring and summer, wells could experience this drop either temporarily or long term. Without significant rainfall to recharge aquifers, many private well systems are susceptible to the adverse impact of dry well conditions. If a well goes dry, the underload condition it causes can destroy the pump and/or motor. Monitoring and diagnosing load issues can save a pump from damage and potential system failure caused by drought. Investing in a protection device before trouble hits can save a lot of time and money for you and your customer in the long run by shutting down the system to prevent damage when a dry well occurs. 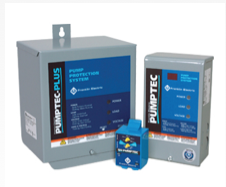 Pumptec, for example monitors motor load and power line conditions to provide protection specifically against dry well/underload, as well as for waterlogged tanks and abnormal voltage. Upon detecting a fault, it interrupts power to the motor to give the well a chance to recover. 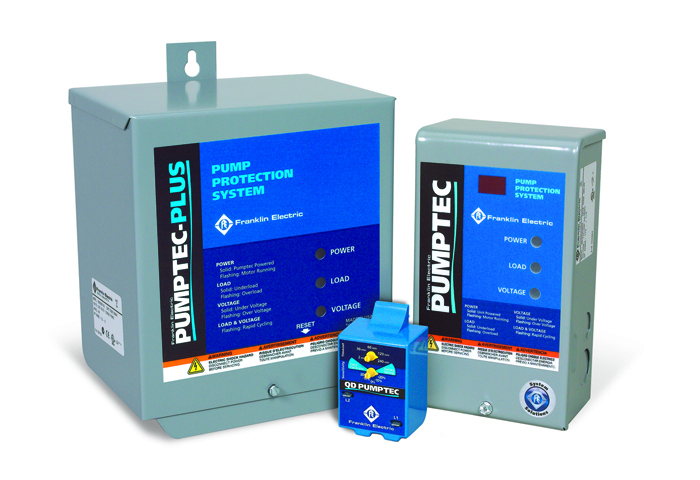 Franklin Electric wants to help make guarding systems from dry well conditions as easy as possible and Pumptec products are an ideal way to ensure a long and reliable pump life. During a lack of precipitation like we are currently experiencing, wells are more prone to going dry, due to either a drop in the water table or the fact that the well is getting used more. Sometimes the best investment isn’t the product itself, but what you do to protect it. We encourage you to protect your investment and make sure that once you put a pump downhole, you won’t have to see it again. For more information about Pumptec, please visit our website, or get more information on how to protect a submersible water system from adversity, contact our Hotline at 800.348.2420 or hotline@fele.com. Throughout the year, Franklin holds all-day training seminars at our three FranklinTECH campuses and other selected locations across the country. These seminars focus on water system basics, the proper application of Franklin Electric submersible products, and troubleshooting. As always, these are provided at no cost to you, and lunch is even included. These seminars count toward Certified Contractor status for the 2013 Key Dealer program, and in most cases, qualify for Continuing Education credit as well. You can also take advantage of the next session at our training center in Wilburton, Oklahoma on September 11- 12. To register for a session, contact our Hotline at 800.348.2420 or hotline@fele.com. Space is limited and registrations are handled on a first come, first served basis, so get your spot reserved as soon as possible. We hope to see you soon at a FranklinTECH seminar this fall! This week, as we wrap up our column-by-column series on single- and three-phase motor specifications, we’d like to touch on what you might call the “greatest hits” from the series. The specification tables on pages 13 – 14 (single-phase) and pages 22 – 28 (three-phase) are very complete, but in the field, there are only a few columns that are used day-to-day. This post will highlight these columns. Keep in mind that much of the information specifically mentioned in this post concerns single-phase motors. 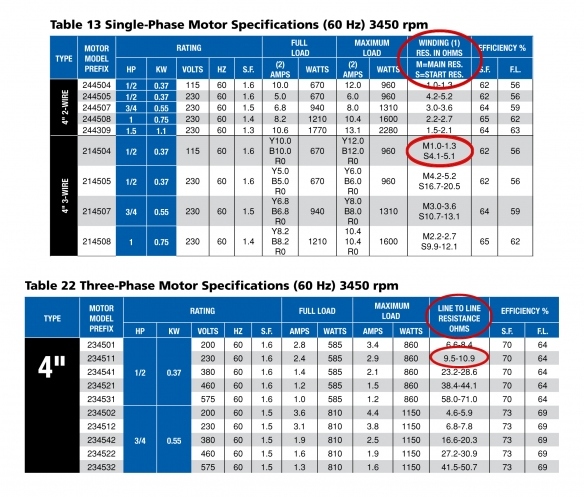 However, as we know from our post Understanding Three-Phase Motors, although there are more three-phase tables, looking at the column headings you can see that it’s the same information. The first column on our most used list is Maximum Load, which has two parts, Amps and Watts. Amps in this context is often referred to as service factor amps or max amps. Maximum Amps is important because it tells us how hard the motor is working. The more water we’re moving, the more current we will need. This translates into where you’re operating on the pump curve. It can also be very helpful in troubleshooting issues and tell us if we’re overloading the motor. The maximum power in watts value doesn’t play into troubleshooting; generally, we don’t measure watts in the field directly. Watts are important to know when calculating the cost to operate a submersible system. For more on that topic take a look at the Franklin in the Field post Deal of a Lifetime. Moving along in our recap, next comes Winding Resistance in Ohms. Always remember that winding resistance is a power-off check. Power must be disconnected and locked out. All single-phase motors (2- and 3-wire) have two windings: a start winding and a run winding. However, on 2-wire motors we don’t have access to the start winding; therefore, in the AIM Manual, only the winding resistance for the run winding is listed. In the case of a 3-wire motor, winding resistance is listed and can be measured for both the start and run windings. Three-phase motors, on the other hand, have three identical windings, and therefore current and resistance measurements are the same. That is why in the AIM Manual, under three-phase motors, we only need one line of information. Regardless of motor type, what does winding resistance tell us? It tells us the electrical condition of the motor and other conductors, such as the drop cable and splices. When troubleshooting and measuring winding resistance, we’ll generally get one of three readings: zero, infinity, or close to the table value. If the reading is zero, the winding (or some other part of the conductor) has shorted. A reading of infinity indicates the winding is open. In either of these cases, the motor or other failed conductor will need to be replaced or corrected. Continuing on in our column-by-column review, we reach Locked Rotor Amps. Sometimes abbreviated as LRA, Locked Rotor Amps is exactly what the name implies: the amount of amps drawn if the rotor is locked and can’t move while electrical power is applied. These amperages generally run about five times higher than maximum running amps. One example of LRA is a bound pump; however, LRA also occur at the moment of start up. Every time a motor is started, it pulls Locked Rotor Amps for a split second. Even though this start up amperage occurs for only a short time, it could be enough to trip the system. Knowing the value of Locked Rotor Amps can be an important aspect on some installations, especially in terms of making sure the system has appropriate electrical service. 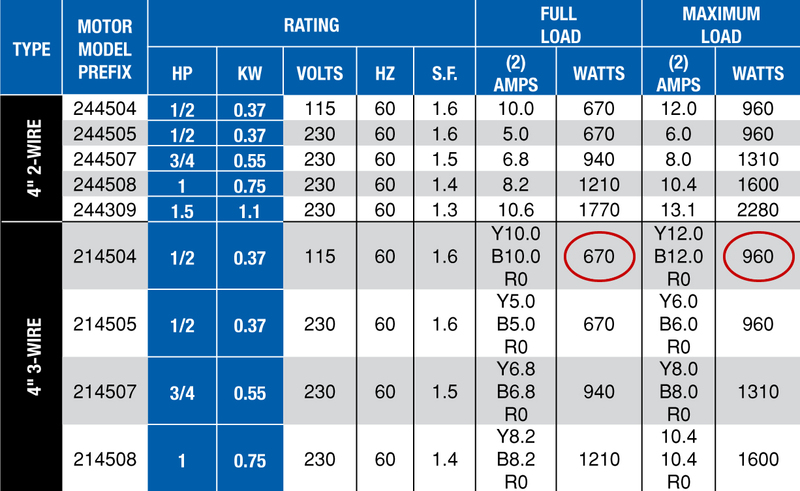 Locked Rotor Amps is also important in the aspect of sizing reduced voltage starters (RVS). To specify a reduced voltage starter we need information located in our next column, KVA Code. 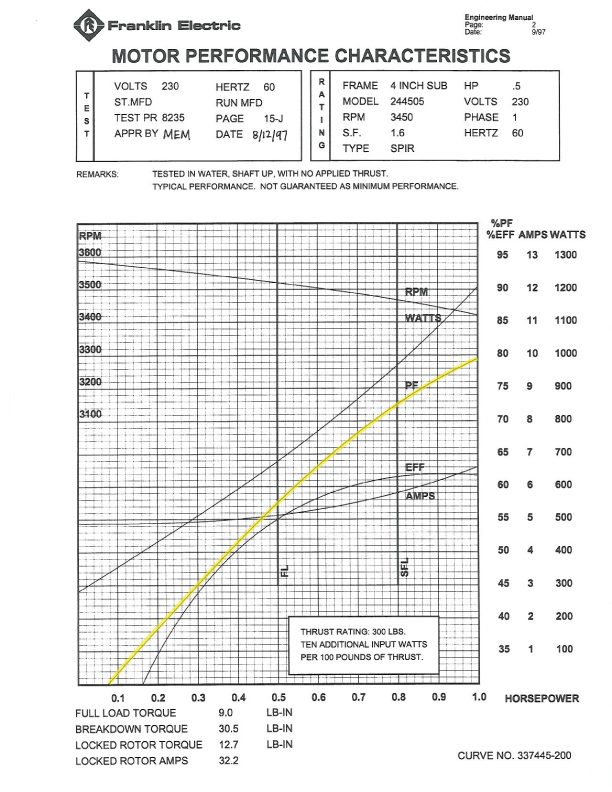 The KVA Code lets us know which reduced voltage starter is needed for a specific motor. This code defines a group of motors based on a combination of their voltage, locked rotor amps, and horsepower. An RVS allows a system to ramp up to full voltage instead of applying power to the motor all at once, thereby reducing the amount of in-rush current. KVA Code wraps up page 13 for single-phase motors, but we don’t want to forget about single-phase fuse sizing, located on page 14 of the AIM Manual. Remember that fuses and circuit breakers are not overloads. Overloads protect a motor and are found in either the motor or the control box. Fuses and circuit breakers primarily only protect the electrical system. That is, they protect the wiring by tripping or blowing due to excessive current. 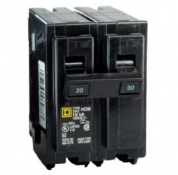 Although fuses and circuit breakers have the same function, they operate differently. A fuse is a type of low resistance resistor that acts as a sacrificial link to provide over-current protection. A circuit breaker is a mechanical over-current protection device, using an electromagnet to literally flip a switch off and cut power. Circuit breakers can be reset, whereas fuses must be replaced. On page 14 one of the first things we come to under amperage of fuses or circuit breakers is Maximum Per NEC and Typical Submersible. Franklin Electric recommended fuses are found under the Typical Submersible column and fall within the requirements of the US National Electric Code (NEC). These fuses and circuit breaker amps are calculated specifically for typical Franklin Electric submersible motor performance. Electrical codes require that fuse or circuit breaker protection be provided as part of an installation, and it’s critical these components be sized correctly. The Franklin AIM Manual offers a wealth of information on all aspects of motor specifications, but there are a few key sections of information that are used more frequently. In the day-to-day of a water systems professional, the above mentioned topics are what you are going to see the most. While some of the information may be available on a motor nameplate, once it’s in the ground the AIM Manual keeps it readily available for reference. For more in-depth and specific information on the above topics, please take a look at their individual posts within the column-by-column series, and, as always, if you have further questions or need help with troubleshooting, please call our Technical Service Hotline at 800.348.2420 or email at hotline@fele.com.